Oh so very gorgeous! I love it! But I am trying hard to perfect the imperfect. The quirk factor is what most ppl are missing and I LOVE it. I'm so glad to hear that you have one illness that I do not Courtney! Does this mean that an affliction is upon me though?? At this point I have a healthy collection of simple modern white china. That's it. :/ 7 sets?!? I think I have the same illness. My everyday white royal copenhagen has been used nearly every day but I am craving a color....maybe black heath ceramic plates. When you have cute dishes like that messy does not seem to look too bad! If I had those dishes I would not mind open kitchen cabinets at all. Plus it would save space! Cute stuff! Shelf is styled perfectly. I just purged a bunch of my dish sets am now down to plain white plus my china. Feeling the need to get rid of :) Thanks for the inspiration photo my dear! I am a little OCD, but those shelves are gorgeous. I too am quite simple and have plain white, classic plates that I love. Can't help it! Hope you had a great day! I love it but wouldn't want to clean it! Crystal only looks great when it sparkles! Unfortunately I'm not a domestic godess! I love it! They're so pretty. Erica, I love patterned china, have used the same set everyday for years and then have white with gold rim for "special" occasions! Ran into someone the other day who had 70 yes 70 sets of dinnerware, I don't even know where I would store these! I will have a new giveaway posted this weekend! Hi Erica, I really love your blogs and have recommended them on mine, crediting all pictures of course! I hope this is OK to you. If not, please let me know and I'll delete post or modify it accordingly. I'll look forward to your updates! Erica, it was so great hanging out with you the other night! Now about your fickleness...I'm a bit like that too, when it comes to china. I have about 6 different styles, and I love them all! Wow Karena! Your friend- 70 sets?! It's gorgeous! Is that Juliska? The display has just enough organization to make it interesting without being chaotic. I love the black. I love the look of cluttered chic. Fabulous! I am loving this post with all of the black and white. The china is to die for! 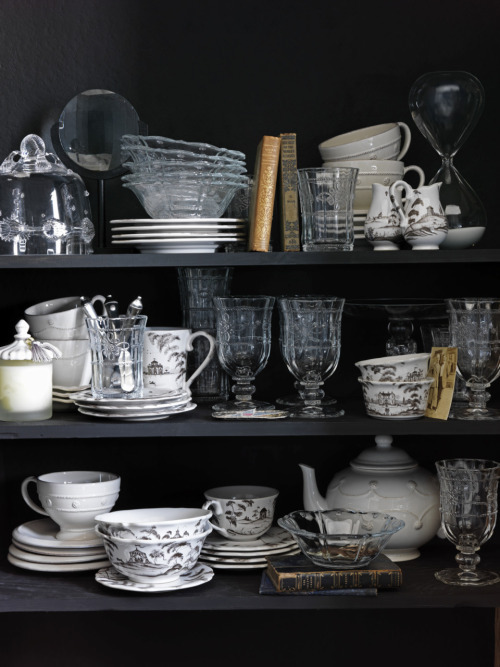 Gah...ADORE that styling on the shelves and think you NEED that china pattern- so so pretty! Oh, yes! To mix them with old books, great inspiration! I have never had more than 2 sets of china but I think it's a great collection. Might have to start looking around for some more.